Recently, a few ideas around Docker converged in my mind and led me to make my own distribution, and to enable others to do the same. Hear me out. Docker is a software packaging tool (a point hammered home to me in a talk by Nic Ferrier). Docker separates build from deployment. Linux distributions are essentially packaging systems. It’s really annoying when you get “distribution clash” between Docker builds, eg when someone writes a Dockerfile for Debian and then you want to integrate it with one written for Centos. This happens. Docker has a layered filesystem, so bloat only matters if you don’t re-use layers. Linux from Scratch exists (and rocks). Putting all the above together I realised that with the advent of Docker there was less of a need to bother with traditional packaging systems at all. Why not build from source? Bug/build issue reproduction (complete audited steps). More efficient space usage (build in the layers/applications you need and no more, share common layers down the dependency hierarchy). Tweaking your distro from a given layer is relatively easy (just add a ShutIt module). Collaboration on improvements much more effective (we’re all talking about the same thing). Auditing builds (for escrow purposes, or even security purposes). A common reference point for applications built in Docker. Dockerfiles/ShutIt can help produce self-documenting dependencies and build steps for porting elsewhere if desired. 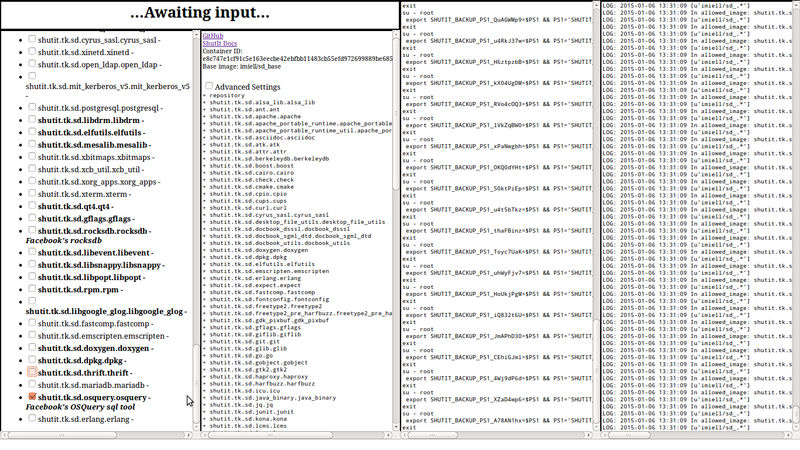 Automated testing is trivial (just run the build, use ShutIt’s test phase). Patching is trivial (docker pull, or just hack, commit, and tag the image). So I built (and present) the ShutIt Distro. Based on the giant shoulders of Linux From Scratch (and Beyond Linux From Scratch) and the broad shoulders of Docker it allows you to effectively create a bespoke distribution to target the application you want, mixing different applications with a few clicks, dependencies managed and all from source. all built from source and with a full bash history available for reference. Here is the sequence of commands to get from debian:jessie (docker pull imiell/sd_base) to the sd_base filesystem artifact lfs.tar.xz (see below). Empty lines indicate just hitting return to accept defaults. 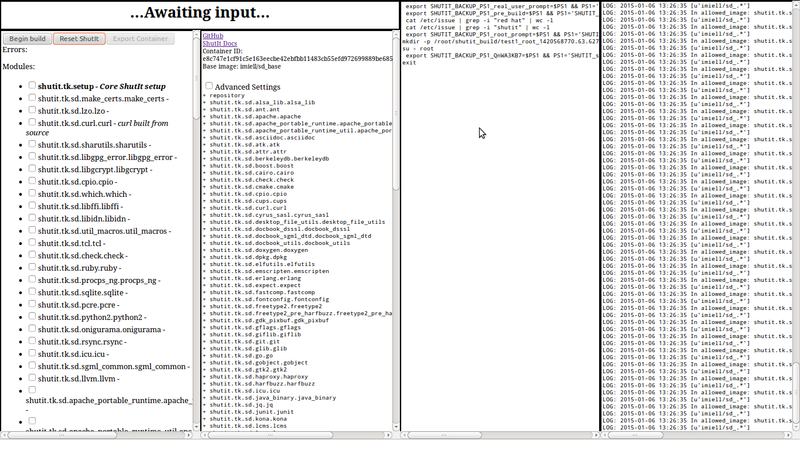 Here is the sequence of commands to get from imiell/sd_base to a complete working OSQuery image. Since the environment is so predictable and restricted, certain aspects of the dependency management process become simpler. ShutIt allows you to produce dependency graphs of your modules with the sc (show config) sub-command. Here is a gist example. You can add any other modules you like to your image. So if you’re an emacs user, you can tick that box and it’ll be added also. This way you can configure your own personalized image. Then scroll back up and click on “Begin Build” to kick off the build. The commands issues will be on the third pane, the log on the fourth. which will import the image ready to run. Using the web interface is not required, but it’s obviously easier than using the command line and configs, and is a good intro to the ShutIt framework. Initially I tried to build the entire toolchain within debian:jessie, but got myself into hot water pretty quickly. Turns out building a toolchain from scratch is quite hard. Thankfully, Automated Linux From Scratch exists, so I just used that. The base image is then delivered to the Docker Hub here. This forms the basis for the ShutIt Distro. Here is a gist for the commands to do this yourself. Note: it takes a while! Sourceforge is in DR mode a lot. In fact, primary sites (eg gnu.org the other day for a couple of hours) generally are down surprisingly often. You’re a complete idiot if you deviate from Linux From Scratch one iota. I did this a few times and was beaten back into line several times with brutal severity. NodeJS and Ruby have surprisingly few dependencies needed to build from source. apt-file is an incredibly handy tool. If you’ve read this far and are still interested, do get in touch.